Rosemary Rice had a busy career on radio and TV. She also played Betty on old time radio's Archie Andrews. 02/04/1975 0218 Death in the Stars A newspaper editor is maddened when the paper's horoscope informs her that she is going to die that very day! 09/02/1975 0337 Portrait of Death A woman fell in love with a rare painting while studying art in Venice years before. Now on her honeymoon, she travels together with her new husband to see the painting once again. When they find that the artwork was substituted by a counterfeit. They come across the woman's old mentor in their search for the original masterpiece. 10/01/1975 0356 Primrose Path A modern take on the infamous abduction of Patty Hearst. The heir of a multi-media news conglomerate is taken hostage by a terrorist group. The kidnapped Mellon soon becomes a willing member of the very group that took him captive. 12/09/1975 0393 Stitch in Time Despite being estranged for over nine years, a billionaire welcomes his 19-year old niece into his home. His secretary is wary of the girl and her suspicions are soon proven right. 02/13/1976 0431 The Blue Roan Stallion A proud "half-breed", Dan Bowles unwittingly saves the life of ranch owner Hale Chalmer. In gratitude, he is hired as a ranch hand and life becomes complicated when he falls in love with the boss's daughter. Despite their differences, the lovers make plans to get married but things come to a head when the foreman challenges the cowboy to a gun-fight because of his mixed heritage. Chalmers saves Dan's life only to throw him a gun when he learns that the man he has just saved is a half-breed. 05/20/1976 0484 The Walking Dead In the future, all androids are mindless robots with one exception-- Rex, who is the most advanced of his kind. Society is threatened when he acquires a macabre obsession-- murdering women. 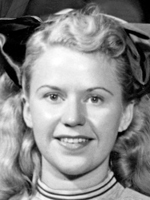 Rosemary Rice Merrell, 87, Stamford Conn., died August 15, 2012, at home. Born on May 3, 1925, in Montclair, NJ, she was the daughter of the late Albert and Laura Rogers Rice. Best known for her performance as daughter "Katrin" (as well as narrator) on CBS-TV's award- winning "I Remember Mama" series, which ran for nine years, 1949-1956. Rosemary Rice's career began while she was attending junior high school in Montclair. She was discovered to perform in the first of 12 Broadway shows. Among her most notable appearances were in "Junior Miss" and "Dear Ruth," as well as "I Remember Mama." Rosemary was also known for her portrayal of Betty on the Archie Andrews radio program. She has also appeared on Playhouse 90, Studio One, Let's Pretend, Calvacade of America, My True Story, CBS Mystery Theater, When A Girl Marries, Young Doctor Malone and the NBC Playhouse. Rosemary was a well-established figure in the world of children's entertainment, having written, narrated and sung nine albums for Columbia Records, where she won a "Grammy Award." She has also recorded six albums for RCA. Rosemary has recorded nine books for The American Girl Collection, and was the voice of Caedmon Records (books on tape). Rosemary's work with children has not been confined only to her albums. She has also recorded 20 text books for the Allyn and Bacon Publishing Company in Boston, Mass. With her warm voice and pleasing quality, Rosemary was without a doubt one of the finest and foremost children's artists of our time. Although she is best known for her nine years as Katrin on CBS-TV's "I Remember Mama," she also appeared in the "edge of Night," "Search for Tomorrow," "One Life to Live," "Kraft Television Theatre," "As the World Turns," "AM Today," "The Mike Douglas Show," "The Today Show," "Dave Garroway Show," and other television shows. Rosemary appeared on and off camera in dozens of radio and television commercials. Most notably for the voice of Clairol "If I've only one life to live, let me live it as a blonde!," Johnson & Johnson products, and was the voice for New York City's World Fair Exhibition for Bell Telephone. During her career, Rosemary was the recipient of three CLIO Awards, The Grammy Award, The Pulitzer Price, three Peabody Awards, and an Emmy Award. Nice voice. Wish she had been in more episodes. Here is her obituary when she passed away in 2012: http://www.nytimes.com/2012/08/23/arts/television/rosemary-rice-daughter-of-tvs-mama-dies-at-87.html. In 1995, I attended an OTR/Nostalgia Convention in Cincinnati. I had the pleasure of working with Ms. Rice in a re-creation of an episode of "Frontier Gentleman." If you weren't looking at her and just listening to her voice, you would swear that she was 21. She was a wonderful talent & gracious lady.